“The very first poem here, bearing a comically long title, yet conveyed, with a compression unprecedented in my brief writing career, the mythogenetic truth of telephone wires and poles marching across a stretch of Pennsylvania farmland. I still remember the shudder, the triumphant sense of capture, with which I got those lines down, not long after my twenty-first birthday”. 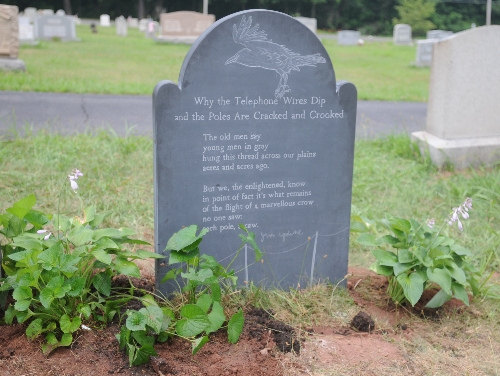 In 2011 his son Michael carved the poem on the back of a memorial stone in Robeson church cemetery in Plowville, Pennsylvania, where some of Updike’s ashes are buried. 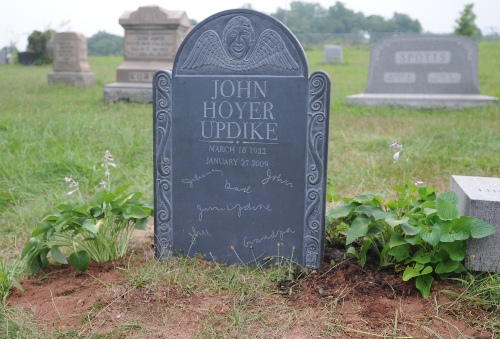 According to the local paper (click here) the poet’s memory was faulty; he had composed it at age 16.